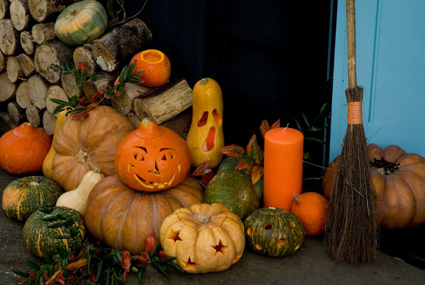 If you have made a Halloween pumpkin lantern and are wondering if there is anything you can do with the seeds apart from eat them or grow more pumpkins, here is fortune telling spell that uses them. 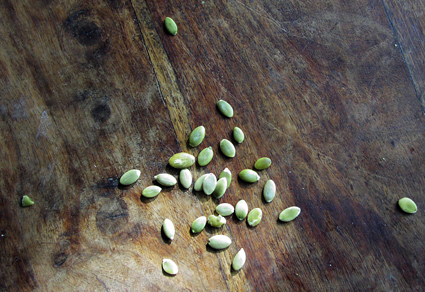 Scatter the seeds on the table and see what shapes or pictures they form to give you an idea of what lies ahead for you. The patterns might not be immediately recognisable as anything, but if you spend a minute or two looking, images will start to stand out. Woman: A female visitor, or possibly some interesting gossip. If you feel you need some help interpreting the symbols, you could look at Tea-cup Reading and Fortune Telling by Tea Leaves, which is available for free online from Project Gutenberg, or can be ordered as a book. The meanings given would be pretty much the same for both these ways of fortune telling, although it is always best if you try to use your imagination to work out what the pictures mean for yourself. The first time I tried this, I got the picture of a house with three rays coming out of it, which you can see in the photo below. It seemed very lucky considering I have big plans for my home. Looking again, I saw the picture could also be a five-pointed star, or pentacle, which is a witches' symbol for magic and protection.